I have so many awesome things I saw or made at last weekends regionals that its going to take me a few posts to share the best with you. I can’t imagine how many pictures and ideas I’m going to come back from convention with. It should be a blast though! 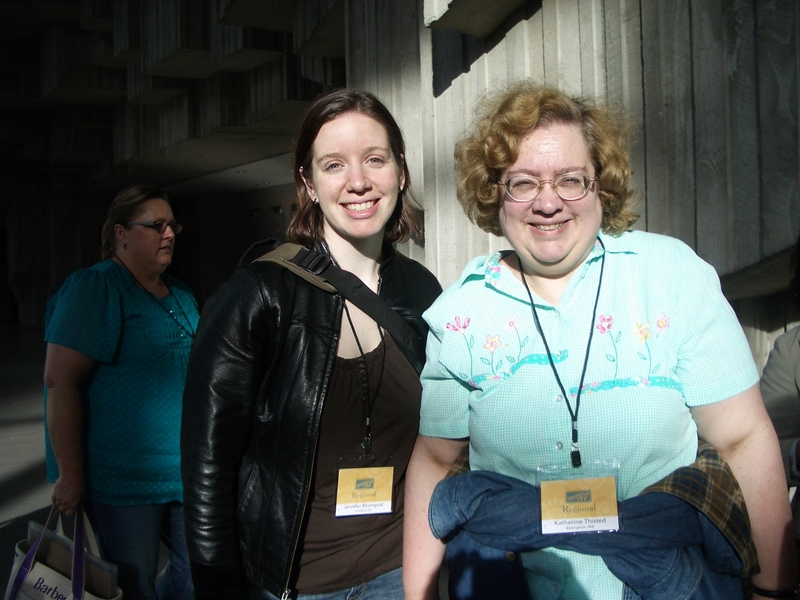 I just had to share a picture of Mom and me, waiting to get let in to the conference room. The energy was high and when they opened the door, hundreds of women started cheering as they raced (yes, literally running!) to grab their seats. Shelli Gardner, the owner and co-founder of Stampin’ Up!, was there to talk to us about the direction of the company and share some of her tips and ideas. She seems really nice and a lot of fun to listen to. So after one of the sessions, we got a chance to say hello and snap a picture with her. I have to say, I was very impressed that when I asked her a question about the product line and gave my thoughts, she was very open with me and seemed to care what I thought. Since I live in Portland, the drive to Seattle is about 2.5 – 3 hrs which means I would have had to get up at 4 in the morning on Saturday to head up to Seattle in time for regionals. Well, anyone that knows me knows I’m not a morning person, so I decided to head up on Friday night and share a hotel room with my mom (who was coming down from Bellingham) so we could get some sleep and be up early, but not too early on Saturday. So 10pm on friday, I arrived at our hotel room. Now, the silly thing is, I decided at the last minute that I wanted to participate in the card swapping that happens at every Stampin’ Up event. So instead of getting them done early like a sane person, I only had time to plan in my head and grab supplies before heading north to meet my mom. Here is the final project we did for the Technique Night. 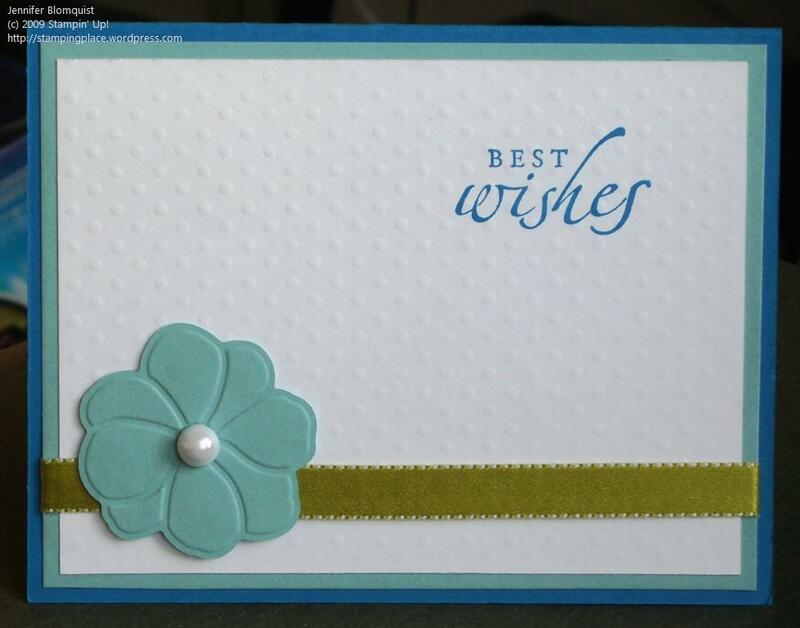 We used texture plates and an embosslit for this card. These are probably my two favorite items for the bigshot and what pushed me over the edge to buy mine. Texture just makes everything cooler and having a perfectly embossed AND cut-out image in one is awesome too. Add in the fabulous kiwi kiss satin ribbon and a half pearl and you’re done! I wanted to put up a quick post before I had to run into work. This week has gone by so fast and has seemed so busy, but the rest of the week should be more relaxing. On Tuesday, I was hosting a Technique Night focused on using the BigShot. Unfortunately, that night I had some folks cancel because of illness, unexpected time conflicts, delays, and getting lost, so it ended up not happening. One the upside, my friend Jennifer recently decided she wanted to make a baby book for her daughter but had been overwhelmed by where to get started. So, since she had come over, I helped her figure out what she needed. 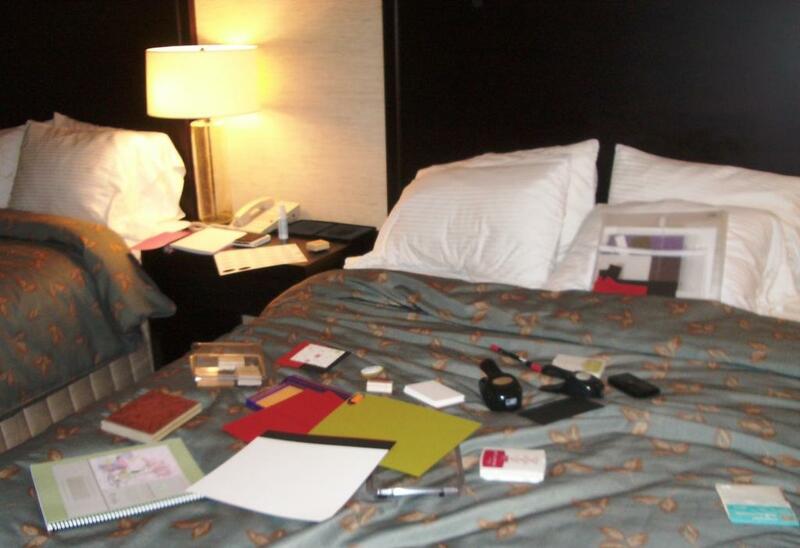 She ended up deciding to get the Stampin Up! Baby Girl simply scrappin kit, and after looking at it more closely, I can’t wait for her to get it because I think it is going to be so stinking cute. Then last night we went to Michaels and picked out an album to go with it. So, I’m feeling good that we got something productive done. So, since the Technique Night didn’t happen this week, I rescheduled it for next Tuesday. I’m trying something different this time. I created a meetup group called Portland Card Makers recently and since some of those folks were going to come, I thought I would try out a public location that most people could easily get to and find parking. So, I ended up finding a Round Table pizza that had side sections with long tables that you could reserve for free. It may seem odd crafting in a pizza place, but I’ve been to an event at a Fuddrucker’s so, hopefully this will work out. I guess we’ll see! Here are some samples I was playing with for the BigShot. The first is a card using the Top Note die. It was an interesting and different way to create a card since the inside of the card is the inside of the Top Note die. 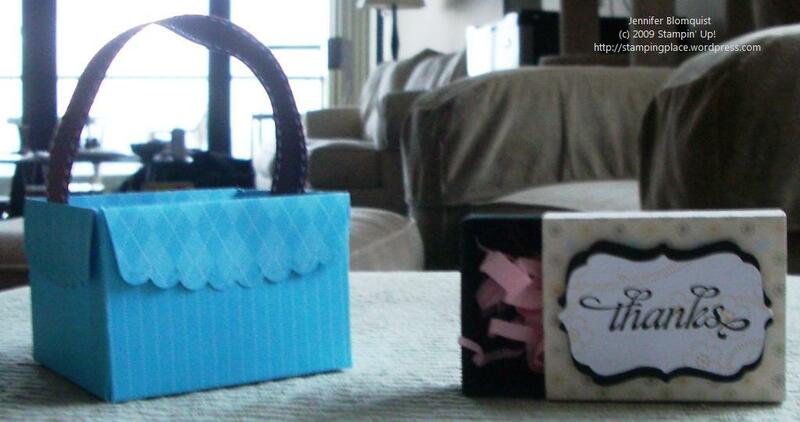 Then, I was going to do a box/basket using the Scallop Envelope die and some ribbon. The last thing we were going to do at the technique night was a card using texture plates and an embosslit but I’m reworking that card right now. And then finally I thought I would share a box I made with the new Matchbox die. It was sooo easy to make since everything is cut and scored for you. You only need to use one piece of sticky strip or snail and its together! Plus the die punches out the label that I stamped and put on top. Easy peasy. 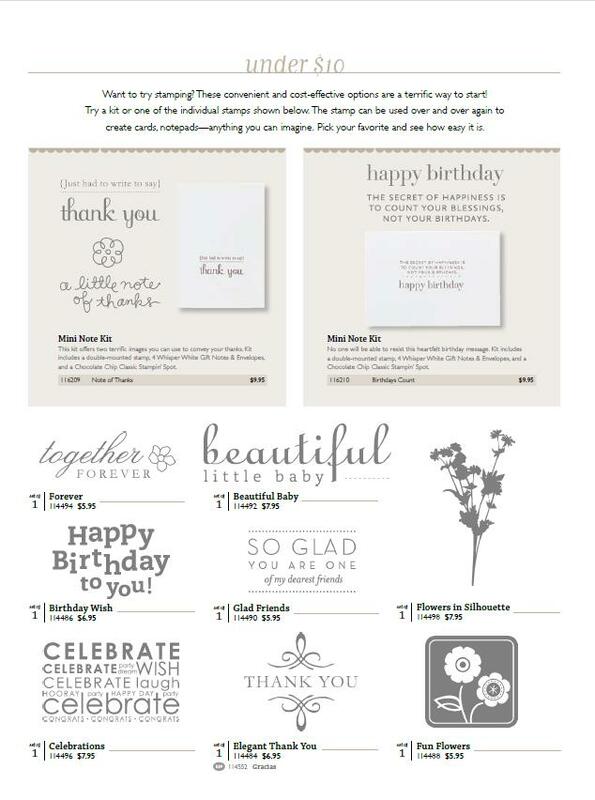 Spend $40 in the occasions mini and get anything on this page free! If you live in Portland, I’d love to have you join us for one of the classes in April. Email me for all the details. BigShot Night – April 7th 7pm. The first Tuesday of each month I host a technique night. This month we will playing with the BigShot die cutting machine. The BigShot can cut out over 50 different types of materials in fun shapes plus create embossed patterns and textures on your standard paper and cardstock. Try it out and make a couple projects and samples. RSVP with your $5 supply fee. Glass Etching with the BigShot – April 19th 2pm. Create beautiful etched glass items from your home quickly and easily using the BigShot. We will be using the BigShot to cut out the shapes that will then be etched on to your own glass. I’ll provide all the supplies including a glass. RSVP with your $10 supply fee by April 15th. Card Night – April 27th 6:30 pm. 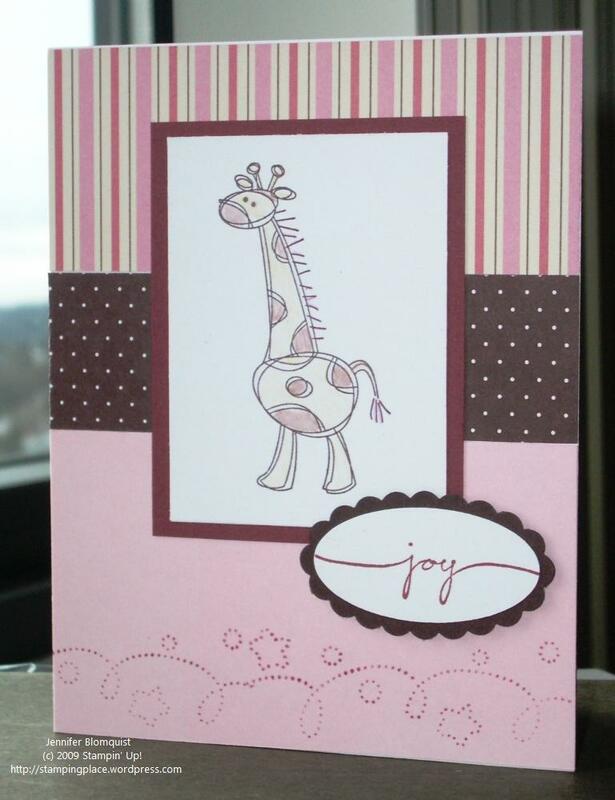 Whether you are a card making pro or just starting out, come join us for laughter and fun as we make 4 cards using different stamps and fun embellishments. RSVP with your $8 supply fee by April 23rd. What a weekend! The usually cold and rainy Pacific Northwest turned beautiful and sunny for the weekend. It got up to almost 80 today, which was just nuts! I was at a craft fair all weekend so I mainly got to see the sunny weather from afar but thankfully it stuck around though the evening so after the fair ended at 6, I raced home to spend a bit of time lounging in the sun. Now if only this weather would stick around for a few days! I had hoped to spend my downtime making a ton of samples and projects but instead spent it chatting and finishing up a number of cards that were in various stages of completion. In the end, I only created one completely new and original card. 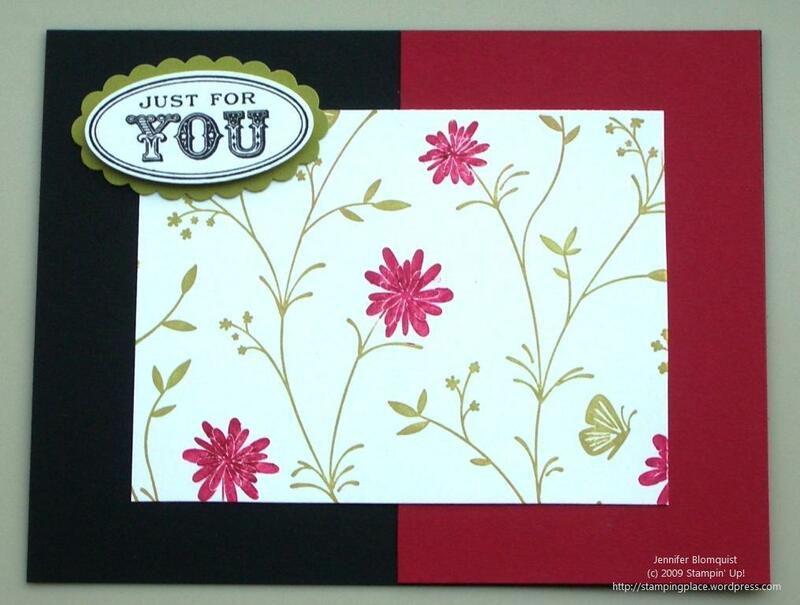 (Though I made a few partials from BigShot die cuts). I was trying to use some of my Occasion mini catalog goodies and so pulled out the paper, Oval all stamps, and the new fabulous scallop oval punch. The flowers are punched out with the BigShot. And speaking of the BigShot, my next Technique Tuesdays is this coming Tuesday and we will be focused on using the BigShot. We will be making 2 cards and a small 3D project. Let me know if you want to come join us and I’ll send you all the details! Hope you all had a great weekend! Here comes monday! 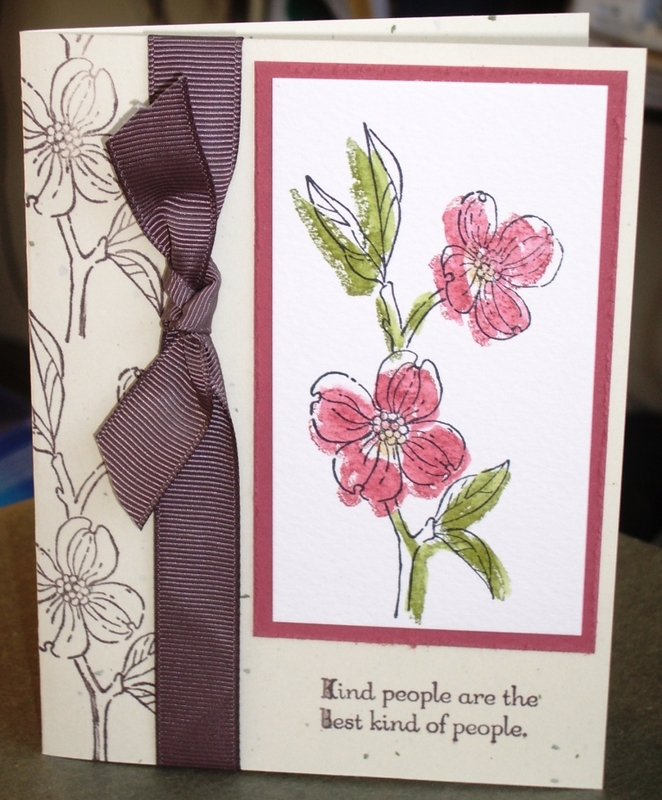 I told you that the card I posted earlier in the week was only first of many to come. 🙂 Last Thursday, my co-worker had her last day at work before spending the next week or two preparing for the birth of her baby girl. I couldn’t let her leave without making her a card. Again, I waited until the last minute but I guess sometimes pressure is a good thing. Almost every piece of this card started as scraps from my pile. I had to use the new, fabulous scallop oval punch. 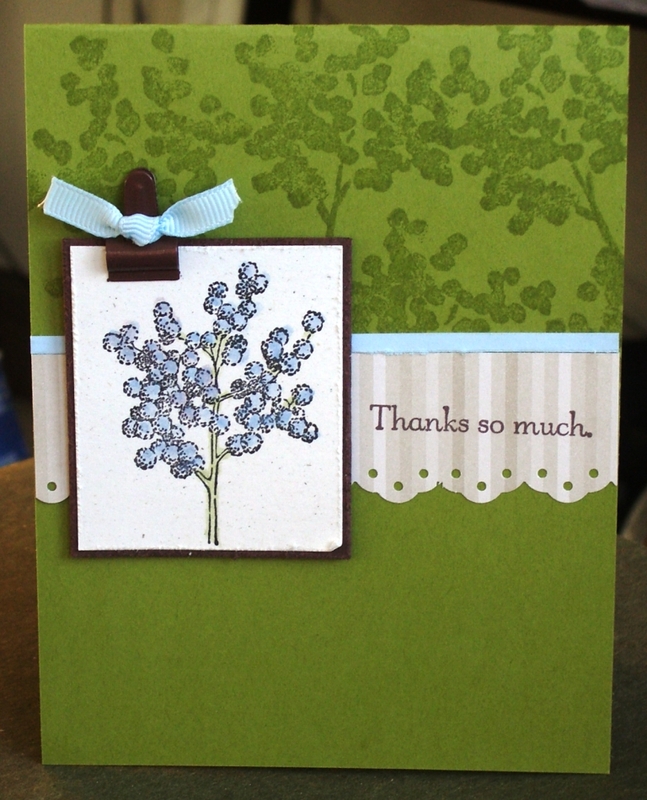 i just love punches that let me layer cardstock. Once I had the card done, I suddenly remembered that they had nicknamed the baby “Lady Bug”. So, I had to add a little ladybug on the inside. She is created completely with circle punchs (3/4″ circle, 1/2″ circle, double circle punch). Such a fun punch art and my coworker loved the fact that I had a ladybug in the card.